Trails and Sails: Digging for History! Come get dirty with us, as you become an archaeologist for the day! 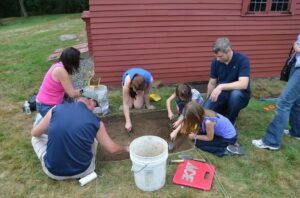 The Rebecca Nurse Homestead was at the center of a summer archaeology program, run by the University of Southern Maine and Phillips Andover Academy, teaching students of all ages how to become archaeologists. Now it’s your turn. Thousands of artifacts have given a glimpse into the lives of those who have walked these grounds for the past millennia, many now on display. At 12:30pm we will have a lecture by archaeologist Dr. Nate Hamilton, who will talk about what has already been discovered over the years. **New this year will be the use of remote sensing to see what secrets are hidden beneath the ground without even picking up a shovel!